It’s hard to believe that 2019 is already here! As with every January, we have challenged ourselves to create a new grilling and smoking resolution—to continue to expand our knowledge of available recipes and cooking methods. This year, we want to take control of the entire cook and celebrate the ease of use and fabulous flavors to be found using a pellet grill! With the right tools and a few delicious rubs, we’re planning to to dive right in this month. Camp Chef Woodwind SG 24 Pellet Grill with Sidekick: Grill, smoke, bake, roast, braise, barbecue, boil, broil, or even sear all your favorite foods with the Woodwind Pellet Grill! Easy to use and with 40% more grilling capacity, you can’t beat this grill for value and versatility. Project Smoke American BBQ Rubs Combo Pack: Specially crafted to highlight the diverse flavors of regional American BBQ, this 3-pack includes Kansas City Smoke Rub, Carolina Pit Powder, and Santa Fe Coffee Rub. It’s never been easier to add unique flavors to your favorite BBQ recipes! Best of Barbecue Pit Mitt: As any aspiring pit master knows, it’s important to protect your hands from burns while grilling and smoking. This Pit Mitt will become like a second skin for you, keeping you safe while you prep amazing meals. Steven Raichlen’s Project Smoke: With 100 surefire recipes, Steven Raichlen’s New York Times bestselling cookbook will be the inspiration you need to use your new pellet grill as a smoker. NO PURCHASE NECESSARY. Open to US residents of the 48 Continental United States, age 18 years as of February 22, 2019. 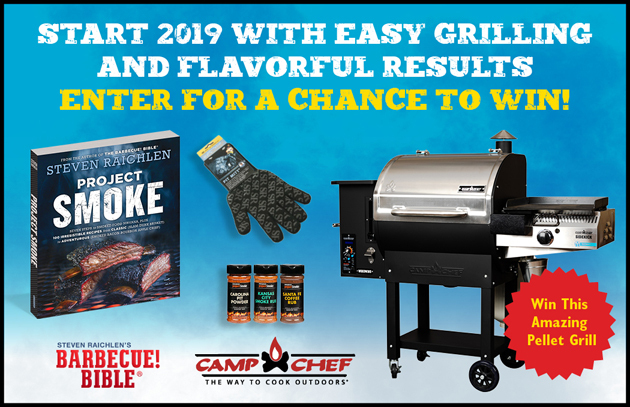 Sweepstakes begins at 12:00 a.m. Eastern Time (ET) on 1/28/2019 and ends at 11:59 p.m. ET on 2/22/2019. Click here for official rules. Void where prohibited. Stream full episodes of Project Smoke and Project Fire online here.